With its screeners facing the possibility of their first missed paycheck on Friday, the Transportation Security Administration is preparing contingency plans so airport security standards do not suffer in case employee call-outs increase further and begin to have an effect on wait times, spokesperson Michael Billelo told ABC News. If TSA secures congressional funding before the agency's scheduled payday, the screeners would likely not miss a payday during the government shutdown. But it remains unclear when the pay hiatus will end. (Joshua Roberts/Reuters) An employee with the Transportation Security Administration checks the documents of a traveler at Reagan National Airport in Washington D.C., Jan. 6, 2019. The agency confirmed on Friday that more screening officers than usual have called in sick since the holidays and the lapse in funding began, but said the bump has not had an effect on security. "Call outs began over the holiday period and have increased, but are causing minimal impact given there are 51,739 employees supporting the screening process," Bilello tweeted on Friday. "Security effectiveness will not be compromised and performance standards will not change. Wait times may be affected depending on the number of call outs." According to his tweet, 5.5 percent of the agency's workforce at Dallas/Fort Worth International Airport called out sick on Friday compared to the usual 3.5 percent. (Erik S Lesser/EPA via Shutterstock) A Transportation Security Agency agent checks the identification of travelers at Ronald Reagan Washington National Airport in Arlington, Va., Jan. 7, 2019. 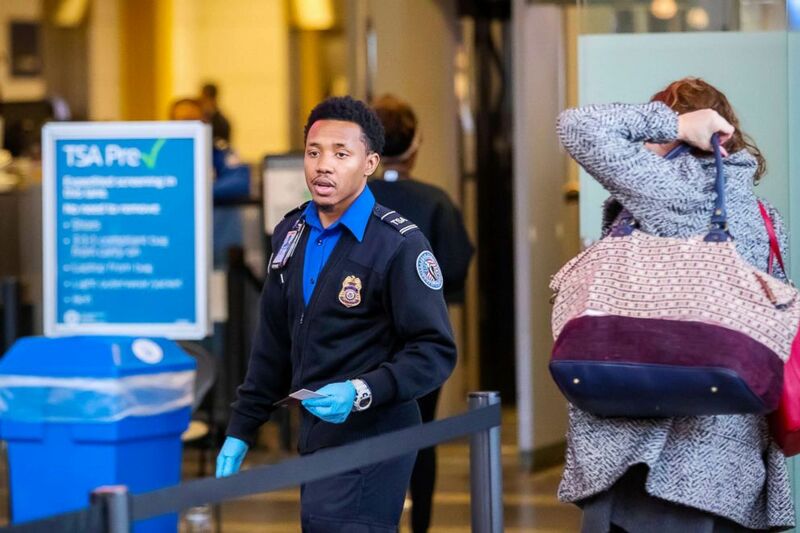 It's not unusual for more officers to call in sick after the holidays, according to the TSA, but the agency is concerned about a growing number of employees not coming to work. But TSA says its screeners have not yet missed a paycheck under the government shutdown. ABC News' calls and emails to union officials have gone unanswered. Typically after a government shutdown, TSA employees who screen passengers are given back pay. 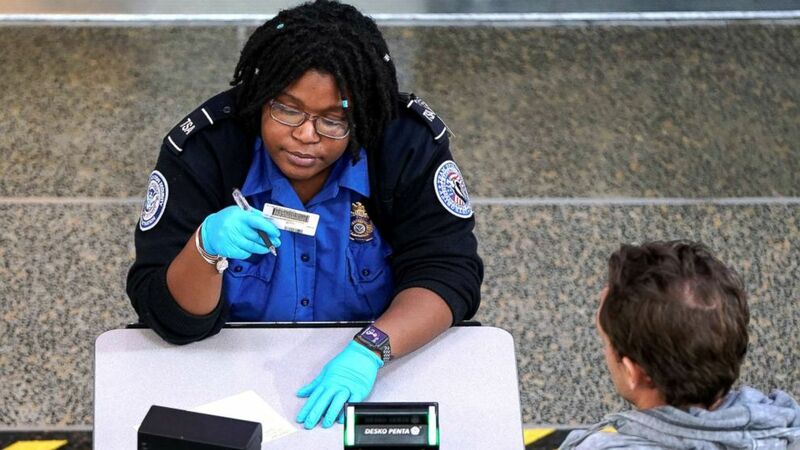 (Erik S Lesser/EPA via Sutterstock) A Transportation Security Agency agent checks the identification of travelers at Ronald Reagan Washington National Airport in Arlington, Va.. Jan. 7, 2019. Images of long lines at LaGuardia Airport in New York on Sunday evening raised concerns about staffing shortages. Bilello tweeted security there "has the staff it needs" and long lines were "due to a high vol of passengers arriving at the airport; many people will be returning to school/work tomorrow; backside of holiday travel & historically busy." LaGuardia Airport spokespeople referred questions to TSA. Airport and airline officials in Dallas, Chicago, Washington and Atlanta told ABC News they were not aware of longer than usual lines or staffing shortages. 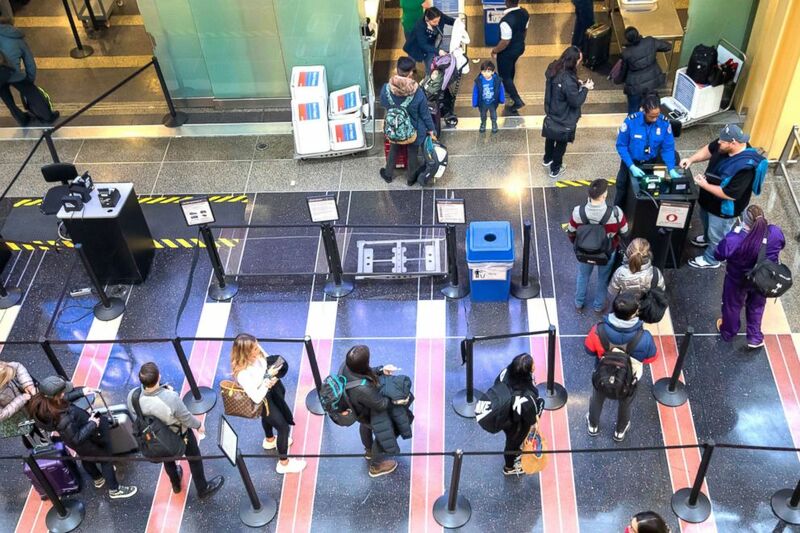 TSA screened 2.22 million passengers on Sunday, according to a statement posted on the agency's Twitter account, and 99.8 percent of them waited less than 30 minutes in line. About 90 percent of passengers waited less than 15 minutes, TSA said. Other federal government workers in aviation are also set to work without pay, like air traffic controllers, but FAA spokesperson Greg Martin told ABC News its employees would not miss a paycheck unless the FAA's lapse in funding stretched to Jan. 15. Martin said he is unaware of increased callouts since the shutdown began.